Want to know who will win today? In Today’s Dream11 Fantasy Cricket Prediction RCB vs SRH 51st T20 Match IPL 2018, we will cover likely playing 11, pitch report of M.Chinnaswamy Stadium, Bengaluru, toss prediction. We will also cover players recent and past performance, dream11 guru prediction, all the latest news and updates of Royal Challengers Bangalore and Sunrisers Hyderabad, weather report of Bengaluru, key players, the best choice for captain and vice-captain, dream 11 best team, where to watch live match of SRH vs RCB and details of live streaming. All the details in this post are taken from very reliable sources. Make sure to read the complete post to get 100% benefit. All the details in this post are absolutely free. Read each and every section as we provide tips and tricks on every section of the post. Where Can You Watch the Live Streaming of RCB vs SRH or Channels to Watch? Who Will Win the 51st Match of IPL 2018 Between RCB vs SRH and Toss Prediction? What is the best combination of players for Dream11 in 51st Match? Date: The match will be played on 17th May 2018 (Thursday). 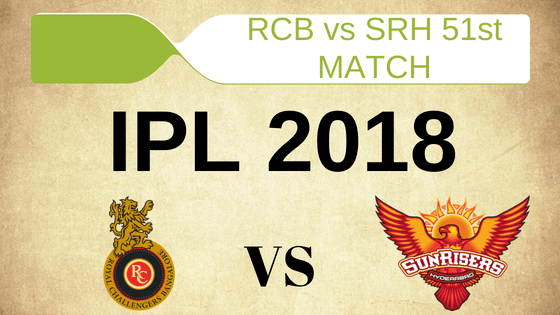 Match: Indian Premier League, SRH vs RCB, IPL 2018. The pitch of Bengaluru, M.Chinnaswamy Stadium used to be a batting paradise but the last couple of season the pitch has changed a lot. In this season of IPL, the seamers took 37 wickets and the spinners took 26 wickets on this ground. The pitch will help all the departments. As the ground is small, it could be a high scoring game. The average first inning score of this ground is 151. The average second inning score of this ground is 138. Highest total on this ground is 201/6 in 20 overs by IND vs ENG. Lowest total on this ground is 127/10 in 16.3 overs by ENG vs IND. On 17th May, it will be partly cloudy throughout the day. Even at the time of the play, it will be partly cloudy but there is no sign of rain. The fantasy users and cricket experts can see the complete game. The temperature is expected to be 26-Degree Celsius and the humidity to be 66%, which may rise up to 98%. If you are a RCB fan than you will be surprised to know that in last five matches, BLR has not won a single match whereas HYD won 4 games out of 5 games and one match was abandoned. In overall encounters, RCB won four matches and SRH won 7 matches. At this venue, Royal Challengers Bangalore won three matches and Sunrisers Hyderabad won two matches. Star Sports has paid a huge amount of INR 16,347.50 Crores to get exclusive rights of IPL 2018 for live coverage for five years starting from 2018 to 2022. Star Sports has all the media rights including TV and all Digital Rights. You can watch the full match of Sunrisers Hyderabad vs Royal Challengers Bangalore, 51st match on Star Sports. In this section, we will provide you with the squad of Royal Challengers Bangalore vs Sunrisers Hyderabad. Parthiv Patel (wk), Mandeep Singh, Umesh Yadav, Yuzvendra Chahal, Virat Kohli (c), Pavan Deshpande, Moeen Ali, Colin de Grandhomme, AB de Villiers, Kulwant Khejroliya, Aniruddha Joshi, Sarfaraz Khan, Mohammed Siraj, Murugan Ashwin, Tim Southee, Quinton de Kock, Corey Anderson, Brendon McCullum, Navdeep Saini, Chris Woakes, Washington Sundar, Manan Vohra, Pawan Negi, Aniket Choudhary. Shreevats Goswami (wk), Manish Pandey, Ricky Bhui, Kane Williamson (c), Deepak Hooda, Basil Thampi, Carlos Brathwaite, Shikhar Dhawan, Wriddhiman Saha, Alex Hales, Mehdi Hasan, Bhuvneshwar Kumar, Shakib Al Hasan, Chris Jordan, Sandeep Sharma, Bipul Sharma, Rashid Khan, Mohammad Nabi, Tanmay Agarwal, Siddarth Kaul, K Khaleel Ahmed, Yusuf Pathan, Sachin Baby, T Natarajan. BLR has managed to win their last two matches and they are still in the race. Today’s match is a must-win game for them. On the other hand, HYD lost their last match but they are in a comfortable position. It will be interesting to see how RCB and SRH make their playing 11 combinations. We will provide you with the probable playing 11 in the next section. Things have not changed that much for RCB but they still have a chance to go to the playoffs. They have won back to back matches and their bowlers are performing, which was a big concern for Kohli. After winning their last match, we don’t think Kohli will disturb the winning combination. RCB will play with the same playing 11. Virat Kohli (capt), Moeen Ali, Mandeep Singh, Colin de Grandhomme, Umesh Yadav, Yuzvendra Chahal, Parthiv Patel (wk), AB de Villiers, Sarfaraz Khan, Tim Southee, Mohammed Siraj. If Wriddhiman Saha is declared fit, he will replace Shreevats Goswami. Sunrisers Hyderabad has qualified for the playoffs but they will not try to experiment and lose the momentum. It is expected that Williamson will go with the same team, except for a couple of changes. Shikhar Dhawan, Kane Williamson (capt), Deepak Hooda, Shreevats Goswami/Wriddhiman Saha (wk), Bhuvneshwar Kumar, Sandeep Sharma, Alex Hales, Manish Pandey, Shakib Al Hasan, Rashid Khan, Siddarth Kaul. Note: Williamson may give rest to Bhuvneshwar Kumar. Note: If you can manage to get the accurate playing 11, you can make the best team in any fantasy leagues. Pro tips: Parthiv Patel is the best option we can see for today’s match. Try to keep him in your teams. 83.82% of the users have chosen him in their dream11 fantasy teams. Pro tips: The above batsmen are most likely to score today. Make a combination of the players for multiple teams. You can also take batsmen from playing 11. Pro tips: Try to keep Shakib Al Hasan in your team. Make a combination of the above players for multiple teams. Pro tips: The above bowlers are most likely to perform today. Make a combination of the above players. If Royal Challengers Bangalore win today’s match they will get two points and most importantly they will have a chance to go to the playoffs. RCB will give their 100% to win this match and according to our astrology prediction, BLR will win the match. The team winning the toss will opt to bowl first as dew will come into play in the second half of the game and chasing will become easier. According to our astrology prediction, Bangalore will win the toss and they will ask Hyderabad to bat first. Virat Kohli has an outstanding record against HYD. AB de Villiers also has an outstanding record against SRH. None of the bowlers from Hyderabad has created a problem for AB de Villiers. Try to keep both of them in your teams. Shikhar Dhawan has scored 246 runs at an average of 49.6 in eight games in Bangalore. The pitch may be a batting friendly, so try to keep as more of a batsman in your teams. Conclusion: This is it for Today’s Dream11 Fantasy Cricket Match Prediction of RCB vs SRH, 51st T20 Match, IPL 2018 which will be played on Thursday 17th May. You can give your valuable feedback in the comment section. Subscribe to our notification of latest updates. GOODBYE!